I have a trivial question that may have been answered elsewhere already : how does this fit ? I had a small dissapointment last year with a shirt, ordered in medium, but clearly too tight for me. Is it wise to go for the bigger size with all the garments ? I can see a man with a baseball bat. can some one explain to me how the colored buttons do anything but detract from the outfit? I don't mind them either - rather the contrary in fact. So people, no one here to help me chose the right size ? Oh, sorry. I think they are justified if you consider wearing this with greenish/brownish pants. Wouldn't look like such a bad choice in this case. I have received a request from Hobo to provide you with some images of our work. However, I am having difficulty figuring out how to do so. I am currently in "Reply to Thread" and the message box options only offer "Post Icons", Miscellaneous Options", "Thread Subscription", and "Rate Thread." Nothing for images. If anyone can give me a hand with any instructions or help, it would be greatly appreciated. Also, I do not know your forum rules for SZ...whether it is cool or acceptable for a designer to make comments about his own stuff/work. If it is OK, and there is any member interest, I might like to try to respond/comment to some of the member comments in the thread--but again, only if it is OK to do so, and if there is any interest. When you are on the "reply to thread" box, just look at the small icons above the text you are typing. There's one looking like a montain. You click on that one, and then you copypast the direct link to your image. It should be okay. Thanks for your tip. However, I am not getting any icons above my text in Reply to Thread box. The icons are shown below the text box and there is nothing that resembles a mountain. I am working on a macbook with a version of Mozilla 5.0 Sea Monkey 1.1.11 browser. Is it a problem with my browser maybe? That's curious. I do not understand why icons would be placed differently. Here's another solution : below the thread you'er actually reading, there's a "quick reply" box, with a white rectangle for the text to be typed, and above which three icons should be visible at the right of an underlined A. You're looking for the second one. It really looks like a mountain, on a yellow sky. All you have to do then is to click on the "quick reply" icon in one of the posts above. This "include image" icon should be at the same place. Or I don't understand anything. :) (Maybe this is a little old though, since the forum has been remade and moved to another platform, but it should provide some orientation, I hope). I'd love some input, so please, proceed! Following your tips I am in "quick reply" box now writing this reply. Above the white rectangle for the text to be typed, here are no icons visible at the right of an underlined A. In fact, there is no underlined A.
I have changed browsers to Safari 3.0.4. I am now looking at "posting rules" box at below left, and it is telling me that "you may not post attachments" although I may post new threads, replies and edit my posts. Perhaps this is the problem. Thank you for the link. Will check it right away, and keep trying. Welcome, Geoffrey. I'm sure many of us would love to hear what you have to say. Sorry I can't be of any further help. About the shirt, there's nothing to be done, since I've sent it back to Pollyanna quite a while ago, and then been properly refunded. But thanks for your kind proposition. actually when I'm making a post i don't get that screen either, the one that avanster posted. 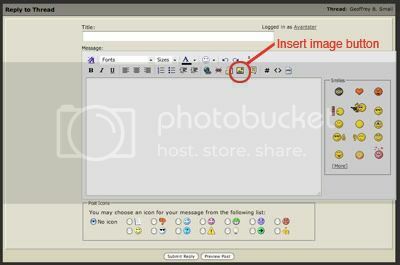 the availability of the inser image function depends on which message editor interface you have selected in the user options. its in User CP > Edit Options > Misc options at the end. select Standard to have more options. However, all the button does is adds the url of the image inside the IMG tags. Because you are automatically getting the "quick reply" window. You need to hit the "go advanced" button. Geoffrey, we obviously would like to hear your thoughts. You are more than welcome to respond. Please read this thread and it will make your navigation here easier.